Winning is good. Food is great. Winning food totally rocks! That's one of the awesome benefits of being a member of the Foodie Blogroll. They have contests and giveaways every month for members. It simply requires checking in every now and again...perhaps following a link and checking out a product that has been donated for a giveaway...leaving a comment on the forum...updating your profile...simple stuff that as foodies we would probably do without thinking twice on any given day. Well, by simply commenting I won two jars of eyes-rolling-back-in-your-head-bliss! 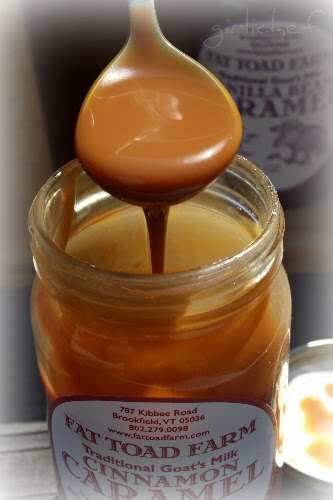 That would be goat's milk caramel...otherwise known as cajeta. Now, I was first introduced to cajeta by Mexi...it's something he grew up spreading on bread, or just eating from a spoon as a treat....or sandwiched between to wafers. Oh man, it's good stuff. 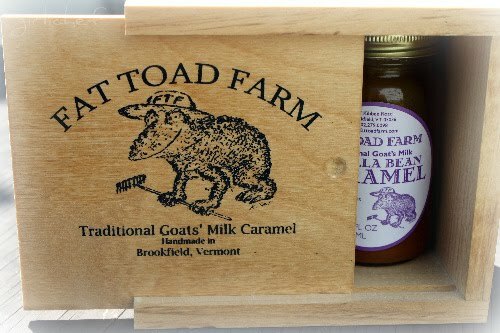 Fat Toad Farm is a small family-run goat dairy located in the hills of Central Vermont that produces both goat's milk caramel and goat cheese...ahhhh, that must be a little slice of heaven, doncha think!? They make "small-scale artisanal batches...spend hours hand stirring our caramel and labeling and packaging" it. The ONLY bad part was having to choose only 2 of their 4 varieties of cajeta. Since I'd only ever had original before, I went with the cinnamon and vanilla bean varieties...they also have coffee bean. Guess I'll have to actually order some of that on my own. Which I will, cuz the others rocked my world! A word of warning- you may want to hide a jar in a cupboard that only you know about. Otherwise you'll have to share. ...I decided that I should eat it with ice cream. Oh ho-lee mother, it is the perfect ice cream accompaniment. I even sautéed up some chunked apples in butter and then mixed some cinnamon cajeta in...too good to even stop to photograph. Seriously. But what I was really craving was some Fried Ice Cream. I haven't had it in ages! I used to order it from a local Mexican restaurant for dessert all the time...only drizzled with honey, which I totally love drizzled on ice cream, btw. As I started thinking about it, I knew I HAD to have it! I asked Mexi if he had ever heard of fried ice cream...and just as I expected, he had not. I figured it wasn't actually a Mexican dessert...just something our restaurant likes to pass off as one. No matter, though...that cold delicious ball of ice cream surrounded by a hot, crunchy layer is good no matter its origins. It was something you could order drizzled with honey, chocolate, or caramel sauce. As I said, I always ordered honey. Always. But if they had served it with actual CAJETA, I may have had a whole different ordering scheme! Now, on to the actual making of the fried ice cream. I'd never actually made it at home, but how hard could it be? Turns out, not that hard. Make a big ball of ice cream...as big as you want. Wrap it in plastic wrap and freeze for a few hours, until very hard. Pour enough oil into a deep pot, enough to deep-fry the ball of ice cream that you made. Heat it until it's very hot...maybe 350°-375° F.
While the oil is heating, pour a bunch of corn flakes into a gallon-sized baggy...enough to fill it ~1/3 of the way. Pour in some cinnamon and some sugar. Zip it closed and crush it up finely with a rolling pin (roll it back and forth until it is a pretty fine crumb). Drop the hard ice cream ball into the baggy and press the mixture onto the outside. Transfer it to the beaten egg and roll around to coat. Place it back into the baggy, packing the corn flake crumbs onto the outside of the ball until VERY well coated. Drop immediately (and carefully) into the hot oil and move it around a bit with a large, slotted spoon/skimmer. This all happens very, very quickly. Pull it back and serve immediately...drizzled with a lot of Cinnamon Cajeta! Fry up a flour tortilla in advance to use as an edible bowl if you so desire...which I did. So desire. Not to sound all school yard bullyish...but, TRY THIS OR ELSE! 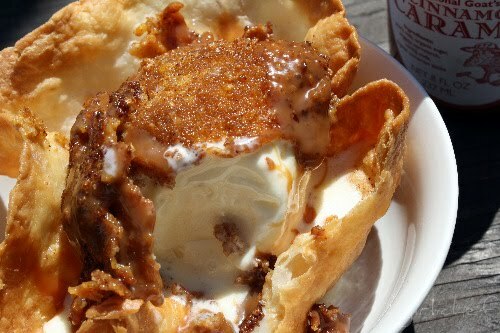 I mean honestly, if you've never eaten fried ice cream...you're totally missing out. You should totally also join the Foodie Blogroll...so you can win cool prizes like this. Or not...that just means more chances for me...and I like more chances to win. Because after all, winning food totally rocks, right? Right. *I won this product through Foodie Blogroll and was sent my prize for free from Fat Toad Farms, I reviewed it because I enjoyed it so much, not because I was compensated or under any obligation. That is officially insane! Amazing insane. My favorite Mexican restaurant does fried ice cream with any of their homemade flavors (Mexican chocolate is awesome!) but I've never had it at home! My goodness! I LOVE this! LOVE fried ice cream but never thought to make it home either. The fried tortilla is perfect. Çok güzel ve leziz olmuş ellerinize sağlık. Hmmm, fried ice cream. That's something we've seen alot in mexican restaurants but never tried. This gives me a good excuse to try it, right? Thanks for the recipe! I wish I can get that fat toad farm caramel milk! Wow - so cool! I always forget about that foodie blogroll. Looking good. I gave you an award but there isn't an icon...just come by and grab the thing! That sauce looks amazing, and I love the name of it! Yum. Something I have always wanted to make, but haven't. Girlichef this looks so incredibly delish! Wow. I haven't had fried ice cream for a very long time. I always kind of wondered how to make it...Looks amazing! First, let me say that I'm so jelly that you won the Fat Toad Farm prize!! I was happy to win my Foodie Blogroll Tote bag but I'm a super fan of Fat Toad Farms and would've loved to get these yummy gifts. That said, I am blown away by this recipe!! All the things I love to eat all wrapped into one dessert! Holy tamales, I could eat three! So inventive and beautifully excecuted, Love your blog and think you're fantastic! Oh my lord. Pinch me. I must be dreaming. Holy smokes! I was hooked from the word go and by the end of the post my mouth was watering. I'm hating life with out fried ice cream and cajeta! I know you and I know you can totally figure out how to make it at home (cajeta) and then I can have it with out ordering and when I want! lol, like RIGHT THIS VERY MINUTE! OMG love love love fried ice-cream! I had it at a Thai restaurant once loved it and tried making it at home. It was a total disaster :( never attempted it again but I just might try it looking at your recipe..It looks PERFECT!! Thanks for the inspiration! This sounds fun and I could pull this off. Like you, never thought about doing this at home. I love fried ice cream but have never tried to make it. Thanks for your recipe. That caramel looks ridiculously good. I probably could drink it. (If I had any left over from pouring it over ice cream.) Yum. it's been years since i had fried ice cream, but i can still taste it. oh how i wish i could grab some through the screen. i really need to try this! Gorgeous, mouthwatering dessert! And even though I still have issues with goat anything...I suspect I might overcome such issues with a dessert like this. That cajeta looks heavenly! Sadly, many of events are just open to the state foodies. 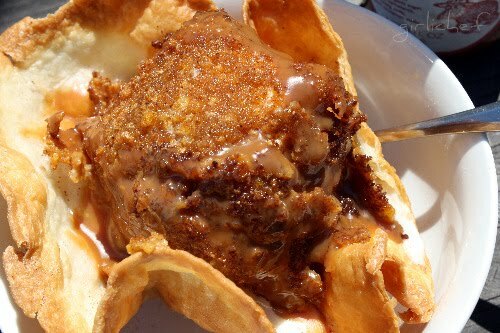 Fried ice cream is kind of cool, isn't it? I had it once ages ago....marvelous. This is amazing - such a great review! Thanks so much for being a member! Totally drooling! Wow, this looks great. You so have the best pictures. Makes me just want to jump right in! *groan* I MUST try this! Wow. That's really all there is to say. Heading over to Fat Toad Farm's website...thanks! that looks so wonderful right now! 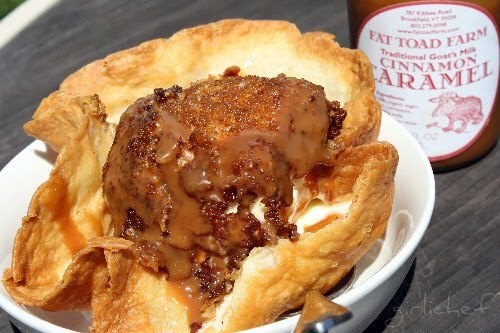 Wow, cinnamon cajeta and fried ice cream - sounds quite heavenly indeed! wow, what an excellent dish you have there- lucky winner! What are you doing to me woman? That is insane and I don't see any possible way of me getting some of that caramel! Deep-fried icecream is served in all Australian Chinese restaurants, but it never looked as good as that!